Neurotransmission is the most important mechanism through which neurons communicate thus generating all brain functions, from the simplest ones (reflexes) to the most complex ones such as cognition and behavior. Understanding brain circuit mechanisms requires to bridge knowledge from single cell level up to large neuronal ensembles. This implies cross-connecting investigations at the cellular and circuiting level. 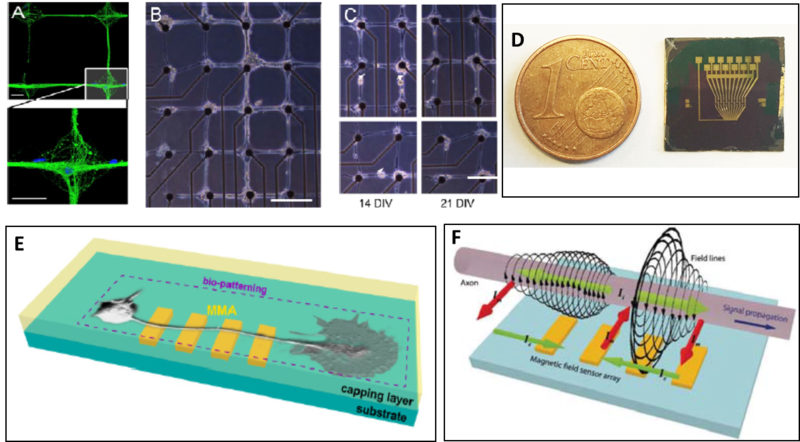 The aim of the UMANA project is to develop an unconventional “magnetic” approach to nanotechnology-based platforms for the in-vitro investigation of neuronal functions, from single neuronal cell to network levels. In particular, strategies for micro-patterning hippocampal neurons will be developed to lay pre-designed neuronal networks onto suitable chips equipped with ultrasensitive magnetoresistive sensors (Multi Magnetic sensor Array, MMA) for the detection of the magnetic field associated to synaptic potentials and to the action potentials propagation along neuritis. This method will be validated by comparison with the standard single-electrode technologies such as patch-clamp recordings, and with other Multi Electrode Arrays platforms based on passive metal-electrodes or active (Complementary Metal Oxide Semiconductor) CMOS-based technologies. We will use MMA to record propagating spontaneous and evoked network activity in primary cultures of hippocampal neurons and in acute cortico-hippocampal brain slices at unprecedented spatial and temporal resolution, studying physiological and pathological responses of the network to distinct stimulation frequencies applied over different temporal windows. The conclusive goal of the UMANA project will be the use of this platform to characterize physiological and pathological network plasticity in wild-type mice (WT) and transgenic mice, model of human hereditary epilepsy.